With cards dealt decide who starts with a quick game of rock paper scissors! or go with the 1st person to pull out an infinite dragon from the deck before dealing. The game commences clockwise – Player 1 plays Player 2, then Player 2 plays Player 3, then Player 3 plays Player 4, then Player 4 plays Player 1 & so on. Similarly if there are 8 players. Advantage here is the universe pot may increase by the time later players come in for the 1st time if it has not been won already. A card is drawn from the top of the universe deck and laid face up in the pot. Player 1 & Player 2 reveal their top cards from own deck to challenge the Universe that lies face up in the Universe pot. The footer at the card explains the interaction of your card to the Universe card & whether your card wins the Universe Pot, joins the Universe Pot or goes to the Void. If the Universe Element Card “Absorbs” your Element Card then your Card joins the Universe Pot. EXAMPLE 2. If the Universe card is Fire & your card is Wood. Fire absorbs Wood so your card goes into the Universe Pot. you come up against an INFINITE DRAGON or DESTRUCTIVE STAR. the same card making the hand a draw. an absorbing card (Wood) vs the Universe card (Water) in which case Player Two absorbs all cards in play. an Infinite Dragon or Destructive Star. EXAMPLE 2. If you reveal a card that is destroyed e.g. If the Universe card is Water & your card is Fire, Water destroys Fire so your Card goes the Void. If you reveal the same card as the Universe Pot then that card joins the Pot. If your card is the same card as Player 2’s card then both cards join the Universe pot unless the Universe Pot destroys the Players’ cards in which case both cards are sent to The Void. ABSORBER of all element cards but NOT the Destructive Star. When played the Infinite Dragon is discarded to THE VOID. When an Infinite Dragon is drawn from the Universe Deck all players have to contribute a card to the Universe Pot from the top of their own deck. The Infinite Dragon is discarded to THE VOID. 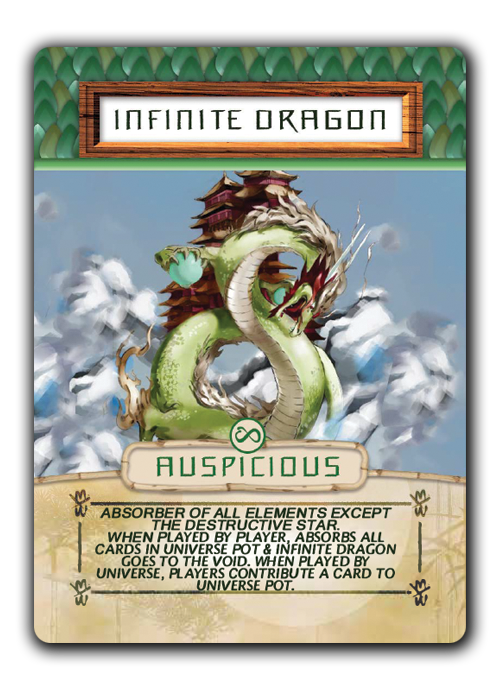 The Infinite Dragon when played by a player it is also discarded to THE VOID while the Player absorbs all the other Element cards from the Universe Pot unless it is a draw or there is a Destructive Star. When 2 players play the Infinite Dragon it is a draw in which case both Player 1 & Player 2 Infinite Dragon Cards go into the Universe Pot. DESTROYER of all elements including the Infinite Dragon sending all cards to THE VOID becoming the sole card in the Universe Pot when played. When a Destructive Star is drawn from the Universe Deck all players have to contribute a card to the VOID from the top of their own deck while The Destructive Star also sends the Universe Pot to THE VOID but remainaining as the sole card in the Universe Pot. The Destructive Star when played by a player will destroy all other cards discarding them to THE VOID. The Destructive Star again remains as the sole card in the Universe Pot. 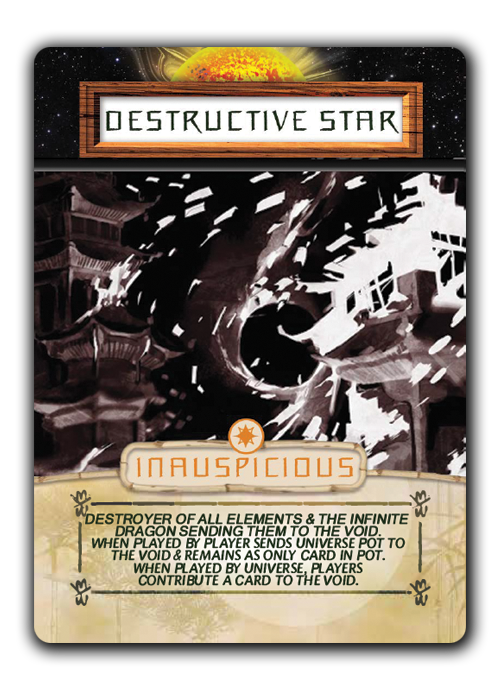 When 2 players play the Destructive Star it is a draw in which case both Destructive Star Cards go into the Universe Pot. No cards in this instance will go to the void. When 2 players reveal the same card that absorbs or destroys the Universe Card the play is still deemed a draw and the 2 cards join the Universe Pot. The Universe takes precedence when there is a draw as the elements from each player are neutralized. “Absorbs” takes precedence over “Destroys” except when there is a Destructive Star. HOWEVER when the Destructive Star is played the Destructive Star takes precedence over all cards including The Infinite Dragon sending all cards to The Void and then becomes the sole card in the Universe Pot. The Destructive Star always remains in play except if one is part of the Universe Pot sent to THE VOID by another Destructive Star or by an Element Card that destroys a Universe Card sending the Universe Pot to the Void. Count who has the most cards in hand to see who wins. If there is a draw then you can have a tie-breaker. The Void can be turned over & become the new Universe Deck laid face down for play to continue. Tie Breaker is where 2 players draw on their last cards. Each player alternatively takes a card from the top of the Universe Deck for a player vs player sudden death until a player absorbs or destroys their opponent’s final element.